At Magen Israel Primary School we believe that learning is an integrated experience, woven into the fabric of each school day. Hands on activities and interactive lessons provide a fully engaging learning experience. With a focus on individual attention and an appreciation for the unique qualities of every student, we endeavor to meet the needs of each child in a warm and safe environment. Our dynamic dual curriculum maintains the highest standards of study, ensuring a rich and thorough Jewish education coupled with a comprehensive general studies program. Our secular studies curriculum conforms to the standards of the Great Neck public school system. Registration is now open for grades K-2. To learn more about our school or to schedule an interview please call (516) 482-2305. Click here here to download registration forms. Click here to view the dress code. To order school uniforms please click here. Office Address: 54 Steamboat Rd. 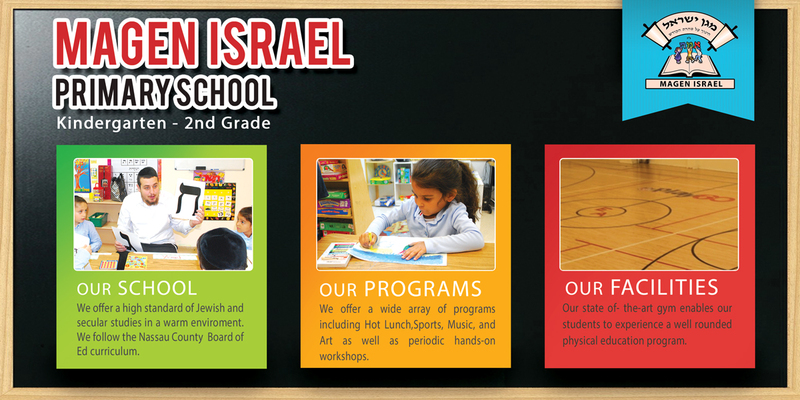 Magen Israel Educational Center was founded by Rabbi and Mrs. Yitzchak Chayempour for the purpose of furthering Jewish Education for the Persian community of greater New York. Since its inception in 1989, we’ve provided a meaningful Jewish experience for the thousands of people who have walked through our doors.